I’ll give it to you as plain and simple as it gets: this is my favorite summer cocktail, raspberry gin. In August, when all the vegetables and all the freshly picked fruits flood our markets, and the women in beautiful summer clothes flood our terraces, it is imperative to know a cocktail recipe that will appeal to all. And this one is fool-proof, versatile and vibrant with freshness. There are two versions of this cocktail: you can serve in a cocktail coupe or in a highball. A cocktail coupe – or a Martini glass! A highball glass – or a small Mason jar! Start, of course, by refreshing your glass with ice. Put all your ingredients except the sparkling water into the shaker. 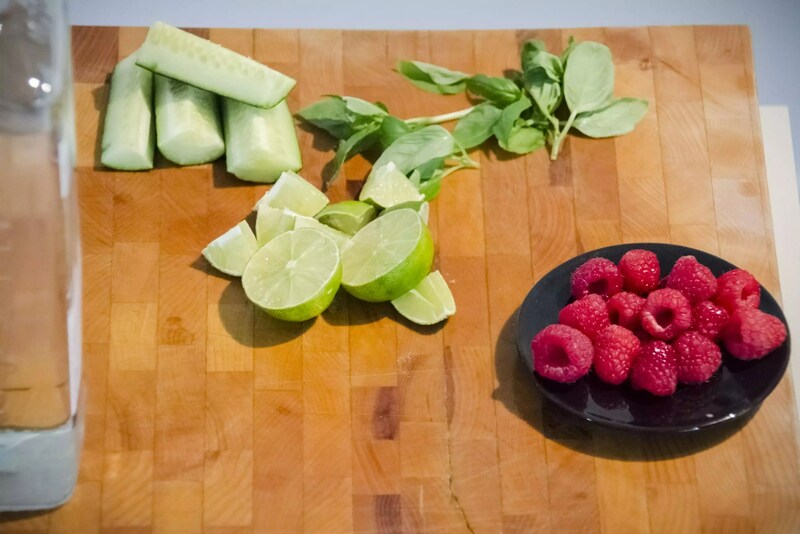 Use the muddling stick and crush all the ingredients in order to extract the juice out of the lime, cucumber and raspberry. 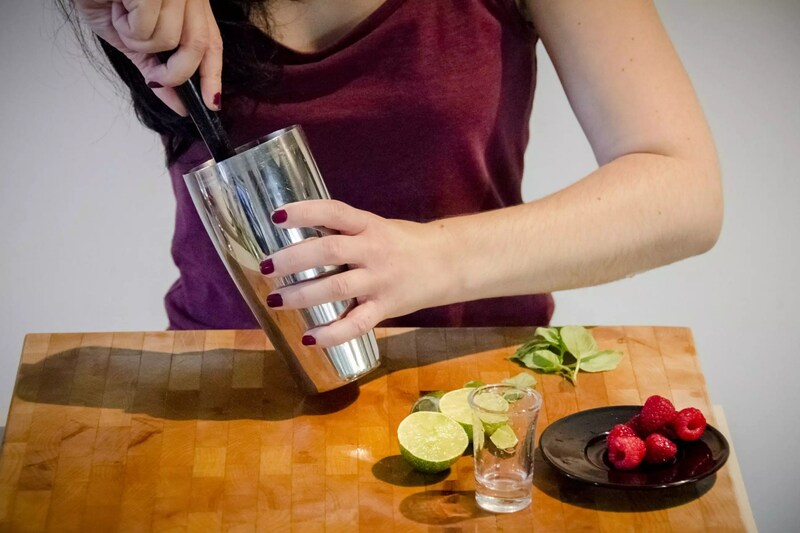 Add a large handful of ice cubes, close the shaker and shake. Count to 12, and then stop shaking. Here, you have two options. If you like small pieces of cucumber and raspberry snacks in your sips, open the shaker, pour everything – ice and all – into a highball glass and add sparkling water. That’s it! My favorite version, however, is the elegant cocktail below. Open the shaker. Then put your strainer on top of a large bowl. Pour the contents of the shaker into the strainer. (The cocktail strainer lets too many pieces through.) 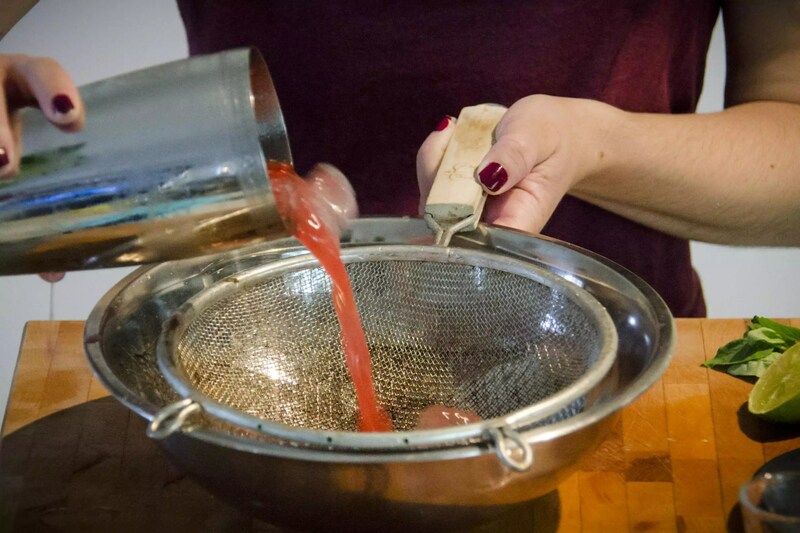 Then, using the muddling stick, try to extract as much liquid from the fruits and vegetables sitting in the strainer. Take the ice cubes out of your cocktail coupe. Then pour the contents of the bowl directly into the glass. Garnish with a lime wheel, a wheel of cucumber, and a small piece of basil. To make a Strawberry Blonde allongé, pour the contents of the bowl into a highball glass, add ice cubes and sparkling water and garnish the same way. VIDEO – Des capsules web Continents & Condiments!